I’m a fresh and saltwater fisherman on the West Coast of Florida, working on expanding his range. 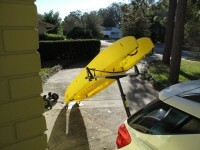 I’ve been a Wavewalk follower for 3 years and Wavewalk kayak owner for 1 year. At the end of February I’ll be participating in the Everglades Paddle-In. Depending on the weather, as many as 150 yakkers will leave Chokoloskee and paddle six miles with the tide to a sandy deserted island, have a catered lunch (conch chowder, of course, among other things) and then paddle back to the launch site to enjoy a barbecue with live music at a restaurant nearby. For all I know, I may be the only one paddling a Wavewalk kayak. To get there I’m going to have to car top my yak for a couple of hours on the Interstate at speeds of up to 60 mph or more. In that regard, I thought I would share what I’m learning with the rest of the blog members. I will be loading and unloading by myself, so I bought something with a tilting arm that enables me to walk the kayak up and down to the roof racks (Unfortunately, I can’t show pictures of the operation because I’m a one man band) I looked seriously at the Yakima Slide-out Roof System with the slide out rack and roller. Unfortunately, the rack didn’t extend out far enough over the rear view window for me to use it effectively. 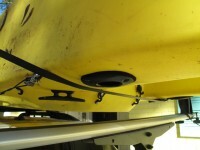 That said, I like the Rhino System, however, I’m not sold on the back strap the kayak rests on. The Wavewalk slides easily on it and the strap makes the system very light, but I think with Rhino would be sturdier with a roller like Yakima uses. Please note: I haven’t had a problem with the cross arm or steel post which slides into the trailer hitch. I experimented with car topping the Wavewalk upside down (thinking it might be more aerodynamic at 60 mph), however, doing it right side up is infinitely easier to load and unload. The problem I now have to face is tying down the front of the yak to the front of the SUV. If I run a strap through the carrying handles, will they hold at 60 mph? Otherwise, I may be faced with having to run something around the length of the saddle and back out to the front. The likely solution will be to put the Walkwalk in stern first, so the cleat will be at the front and then run something through the handles at the rear of the SUV where I assume the yak will be subject to less lift. Another issue I’ve had to face is that on the Equinox, the hood doesn’t slope toward front bumper. It angles down slightly forward and then plunges down. The metal part of the bumper is not easily accessible and it’s surrounded in plastic, so vibrating rope or straps will likely cause damage at high speeds. Fortunately, I’ve found straps that attach to bolts under the hood. (I’ll show how they work in a follow-up post) so I can tie off to them. Any thoughts or experience anyone would like to share would be appreciated. And, yes, I need to power wash the yak. Now I’ve owned a W500 for the past couple of years. No complaints. I use it in lakes, rivers and out on the flats. It tracks well. You can paddle through whitecaps and swells. Want to carry 2 adults? You can do it. Best of all it’s very stable. I can easily stand up and cast a fly rod, throw a cast net or just pole or paddle. Sitting more upright than leaning back in an L position is much easier on the back than traditional kayaks. My longest trip was 14 miles in the out of Chokoloskee. I only started getting stiff and sore after about 8 hours (I’m 57). There’s lots of storage in the front and back of the two hulls. It’s highly adaptable. I’ve seen people add small outboards or poling platforms. It’s not as fast as some of the longer thinner yaks and it rides a little higher in the water so it catches more wind. I don’t take it offshore. At 60 pounds, it can be cartopped. I have an SUV and travel a lot by myself. The best one man loading device I’ve found: the Rhino-Rack. 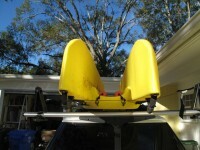 For travel from car to water I use a C-Tug, but there are a lot of other ways to add wheels. 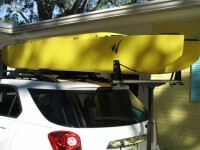 I wouldn’t worry that much about attaching your W kayak to your car rack, if I were you. 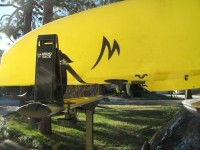 The way most W kayak owners do it is have the cockpit face upward, and attach straps across the kayak in front of the cockpit and behind it. If you can run the straps through the eyelets in these areas, it would be even better. If there’s no way for you to run them through the eyelets, using ropes would be just as good. 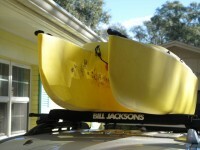 There is no real need to attach the front and back of the kayak, unless the state in which you live mandates it. In this case, you’d have to comply with the law, but remember that attaching this kayak the way I described is basically enough. These are simply 2-inch u-bolts mounted with a cross plate underneath and 2 nuts above and below the hull. I then run my 1-inch ratcheting tie-down straps through the loops and attach them to the rack’s rails. 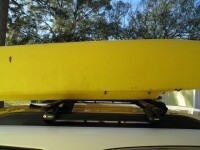 I have driven the kayak this was over 1,000 highway miles at >70mph with never a slip. Even when driving directly into the wind which can create effective wind velocities >100mph! The boat simply can’t move. This spring I will modify the installation by sliding clear vinyl tubing over the bolts prior to installation to make them soft to the touch (and gentle on your hands 🙂 ) and even quieter. I refer to them as Super-Loops because I use them as rod-holders and as a paddle holder, both while fishing and when transporting the W500. The straps simply go over the rods and paddle and hold everything in place perfectly on the highway. I’ll do a full story/instructional about this in the spring but suffice it to say it is the single best “mod” I’ve made to the Wavewalk. Excellent idea, Michael. I may have to copy it. Your Super Loops could also be used to hold a push or stake out pole as well. In thinking further on your set up, I have a question. Do you ever bang into the Super Loops while paddling? If so, I think I might move the loops closer to the ends of the cockpit, so I don’t spook a redfish or any other skittish flats fish I might be after. Thanks Judson. Yes, you’re right abut attaching other things to these SuperLoops. And with small carabiners you can attach almost anything; pliers, fish-grippers, anchors, etc. I always carry my W500 with the cockpit up. Last summer I drove about 45 minutes in a torrential downpour but when I got home there wasn’t even a quart of water inside. I suspect that the air flow from the windshield and/or the gunwale deflects the rain. But even when there is water inside, a quick flip followed by raising one end to waist height and then the other and the boat is completely empty. They do not interfere with paddling in the least, the fore and aft placement being the key. In the meantime, just take Yoav’s advice and add one stout rope through the eyelets (eye pads) to your tie-down system. 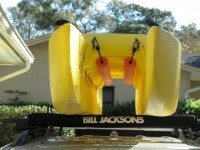 This will prevent fore/aft motion without excess downward force on the gunwale.